As Indie Week Canada comes to a close I want to highlight Moonlight Social, they’re my pick of the week. The band travelled up from Austin to play our town and check out the conference. They were on stage at Supermarket on Thursday and then they headed to Boots ‘n’ Bourbon Friday and Saturday. I was there for Friday’s set, The Royalty Records Showcase and while they may not have won, I thought they put on an amazing show. If it’d been up to me, they’d have taken first place Friday night. 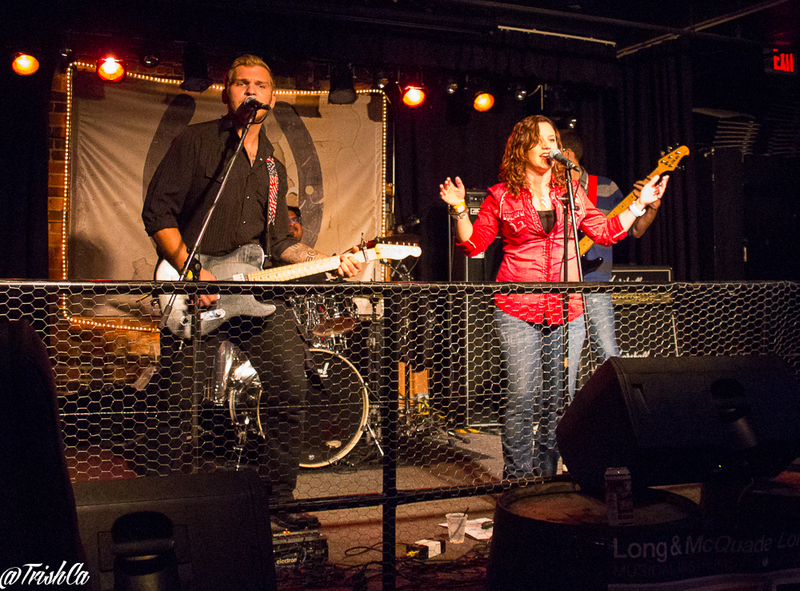 Moonlight Social is a country rock duo, Jennica Scott (vocals) and Jeremy Burchard (guitars and vocals) who were were accompanied by Danny Sanchez (drums) and Andrew Molever (bassist). They may be new to Toronto audiences but they’ve been paying their dues since 2011. They’ve shared the stage with the likes of The Eli Young Band, Florida Georgia Line and one my favourites, Thomas Rhett. Now headed back to Austin, they’re one of four finalists in the Recording Conservatory of Austin’s Unsigned Artist Competition 2014. Make sure you check out their website. My first in person encounter with Jennica was, of all places, in the ladies room. She was singing along to the music and I knew before I saw her, that it was her. I’d been listening to Moonlight Social videos all week and her voice was unmistakeable. I got a few shots of the band and unfortunately had to run so I wasn’t able to meet them in person. They were kind enough to answer my interview questions via email. Thanks guys! We were among the first artists accepted to play the Indie Week Canada music festival. We had spent some time up north, including festivals in Michigan and Wisconsin, and we knew it was worthwhile to expand our reach. There are some great country fans up here, and we’d heard of the burgeoning music scene of Toronto, and we thought it would be really accepting of our brand of modern country. It was our first international shows, so it made sense to make the most of it by networking at industry panels and really getting a feel for the city. After a few days here we all knew we want to come back. 2) How’d you travel up? We thought briefly about driving our van up here, but it ended up being just as economical to fly instead of spend money on gas and travel days. When we were told the festival would provide backline for us and we just needed guitars and cymbals, it made sense. Jeremy’s mom and grandma actually decided to fly up from Lubbock, Texas (Jeremy’s home town) because they had wanted to visit the city for a while. It was great having their support! It’s funny because it’s not always easy for family to make it out to our shows in the states, but it worked out after traveling thousands of miles! 3) Where did you stay and what was your favourite Toronto thing? We stayed pretty much right in the heart of downtown by the Dundas square. We did a lot of walking in the area checking out all the clubs, restaurants, and downtown area, and we also got a chance to go to Niagara Falls (and the hockey hall of fame! Jeremy is a huge hockey fan, even being from Texas). But honestly, our favorite part was probably the people; seeing all the different neighborhoods and getting to meet people from all over the world really was cool. People are nice in Austin too, and we’ve got the whole southern hospitality thing going, but they’re just not as worldly. You really get the sense that Toronto is a world city. 4) Did you try sending the EP to labels before Kickstarting an album? We sent out a few copies of our self-produced EP to get feedback and everything, but we knew from the very start of Moonlight Social that we wanted to put in the work as an independent band before ever considering a label. The Kickstarter campaign was a wonderful learning experience, and we’ll always hold that process near and dear to our hearts. We’d dreamed of having a professional album our whole lives. Matt Noveskey taught us so much about the process. At the same time, we’ve matured a lot since then. We’ve really come even more into our sound; in a lot of ways, I don’t think a label worth being on would’ve known what to do with us first starting out. We’ve been able to hone in on what we do best and what makes us unique as artists, and that makes us very excited for what we’re going to offer in the near future. We also matured our business sense and have spent that time building a team around us that we love and trust (lawyer, management, booking, CFO etc.). Now we’re working a business plan that we feel confident is going to help us make waves, expand our reach, and connect with fans all over. It’s been a real blessing. 5) Canadian country music – is it making an impact in Austin? 6) Last thing and platform you listened to? We’re best friends and business partners, and we also live together — but there’s no romance between us. We get the question all the time, and honestly it’s awesome that people can sense the chemistry we have with each other. We spend a lot of time together, and go through all of the human emotions — joy, sadness, frustration, hope, disappointment, resilience, etc. — that just kind of naturally foster that chemistry. It’s a combination of shared experiences over time and that intangible “something” that just clicks when we start making music together. There have been times when people either just assume we’re together or try to force that narrative, and it’s just not important to us. We’re not interested in being something we’re not or distracting from the number one thing, which is the music. We want the chemistry between us on stage to translate to chemistry between the band and the crowd as well. The Unsigned Artist Competition is something that spans the state of Texas and is hosted by the Recording Conservatory of Austin, an audio engineering school that pools talent and resources from the Austin music scene. Our drummer Danny actually submitted us months ago. They received more than 400 submissions from across the state, and their judges narrowed it down to the top 25, which we made. From there, artists were asked to garner votes from their fans. Our fans ended up voting us to number 2. The next step is to go into a studio and record two songs live, which they’ll film. Those songs will be put up for people to see, and their panel of judges will vote the order of the top 4 (with some consideration of fan views). For us, it was something that very much came out of nowhere. We didn’t even know Danny submitted us until we made the top 25. But a lot of the bands that are a part of this have had significant traction and motion in the Texas scene, which is great — not to mention the prizes of studio time etc. would be great for us. But really, the whole thing is just an incredibly humbling experience to see the support we have from our fan base, as well as the wealth of talent we get to share the stage with. It’s great to show venues and others the type of progress we’re making. Winning would be incredible, but even just being in the top 4 unsigned artists in Texas is…it’s a wonderful feeling. We don’t make music for these certain types of “validation” per se, but we absolutely welcome it! Making music is beautiful and wonderful, but successfully operating a band can be thankless, frustrating, and grueling in a lot of ways. A lot of long drives and long nights. Every now and then, it’s nice to get a pat on the back and boost up that comes from both fans and the industry like this. Some very exciting things. We’ve actually put together, along with our team, a big business plan that we’re slowly enacting as resources become available. We want to be a big name in the country world, but we want to do it our way. We think we’re taking the right steps to do so. Most immediately, we’d love to release a few new tracks that we’ve been working on. We’re also going on a radio tour around Texas at the beginning of 2015, while expanding our touring throughout the states. And hopefully back up into Canada!